**Fresh Arrival**Rear Power Sliding Window**Class IV Receiver Hitch**Uconnect 4 with 8.4 Display**Single Disc Remote CD Player DESIRABLE FEATURES: U-Connect, Alloy Wheels, and Remote Entry. Your 2019 Ram 1500 Big Horn is perfect for daily work or weekend road trips to our neighboring communities of Milwaukee, Mukwonago, Watertown, Waukesha, Oconomowoc & Brookfield, Wisconsin. This 2019 Ram 1500 Big Horn features a Gray exterior with a Diesel Gray/black Interior. 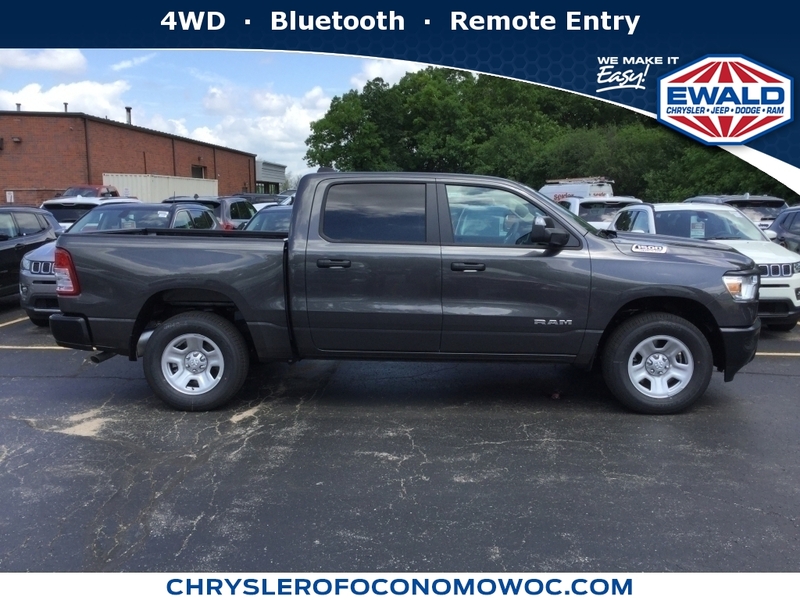 With 9,823 miles this 2019 1500 with a hemi 5.7l v8 multi displacement vvt engine is your best buy near Milwaukee, Mukwonago, Watertown, Waukesha, Oconomowoc & Brookfield, WI. TECHNOLOGY FEATURES: Satellite Radio, Steering Wheel Audio Controls, Android Auto Compatible, an AM/FM Stereo, and an Outside Temperature Gauge. Your Gray 2019 Ram 1500 Big Horn is available for immediate test drives in Oconomowoc, WI. STOCK# D18D412A PRICED BELOW MARKET RETAIL VALUE! 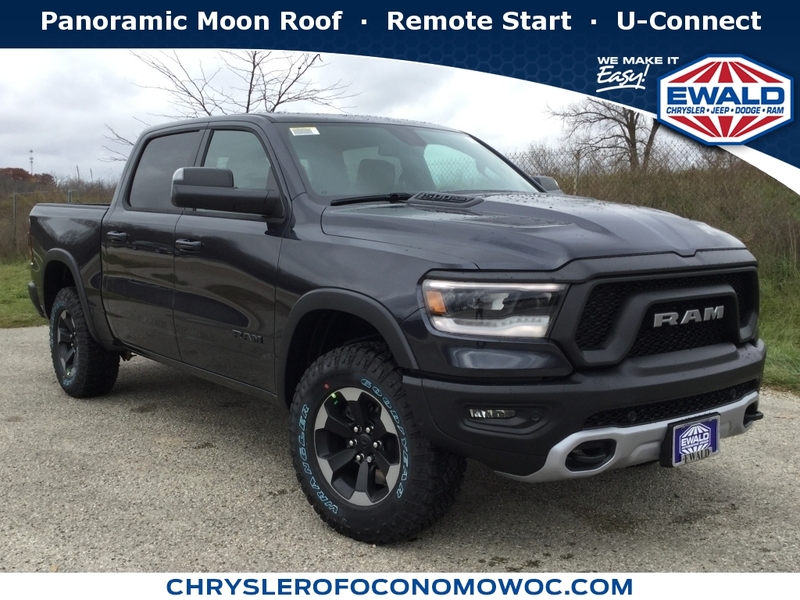 Ewald Chrysler Jeep Dodge Ram Oconomowoc has this used 2019 Ram 1500 Big Horn for sale today. Don’t forget Ewald Chrysler Jeep Dodge Ram Oconomowoc WILL BUY OR TRADE FOR YOUR USED CAR, USED TRUCK and/or USED SUV! 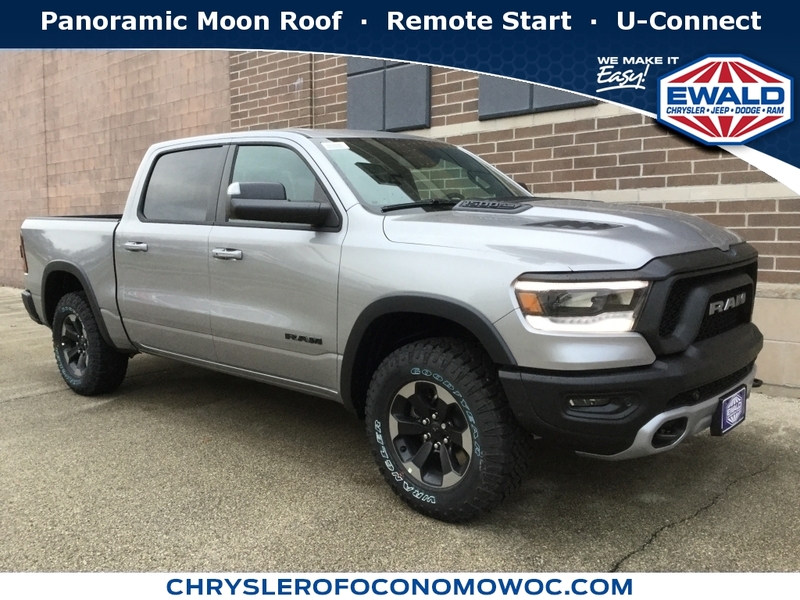 Our Truck Dealership in Oconomowoc: Call Ewald Chrysler Jeep Dodge Ram Oconomowoc today at (262) 228-6733 TO SCHEDULE YOUR TEST DRIVE of this 2019 Ram 1500 Big Horn! Ewald Chrysler Jeep Dodge Ram Oconomowoc serves Milwaukee, Mukwonago, Watertown, Waukesha, Oconomowoc & Brookfield, WI. You can also visit us at, 36833 E Wisconsin Ave Oconomowoc WI, 53066 to check it out in person! Ewald Chrysler Jeep Dodge Ram Oconomowoc Used Truck Superstore provides RAM truck parts and service for new and used truck owners near Milwaukee, Mukwonago, Watertown, Waukesha, Oconomowoc & Brookfield, Wisconsin. MECHANICAL FEATURES: This Ram 1500 comes factory equipped with an impressive hemi 5.7l v8 multi displacement vvt engine, an 8-speed automatic transmission. Other installed mechanical features include Power Windows, Heated Mirrors, Power Mirrors, Traction Control, Cruise Control, a Tire Pressure Monitoring System, Intermittent Wipers, Variable Speed Intermittent Wipers, a Tachometer, Power Steering, and a Trip Computer. Ewald Chrysler Jeep Dodge Ram Oconomowoc is Southern Wisconsin's only location where you can test drive a new, used or Certified RAM truck. That’s why more Wisconsin used truck shoppers and owners drive to Ewald Chrysler Jeep Dodge Ram Oconomowoc in Oconomowoc for genuine RAM truck sales, service, parts and accessories. SAFETY OPTIONS: Electronic Stability Control, Brake Assist, Overhead airbag, Occupant sensing airbag, Delay-off headlights, Dual Air Bags, Anti-Lock Brakes, a Passenger Air Bag Sensor, and a Front Side Air Bags. This 2019 Ram 1500 Big Horn comes standard with peace of mind for any driving conditions. That’s why we offer the MAX Allowance® smartphone communications system where you can share photos, video and vehicle history details with our Seller’s Agents. Ewald Chrysler Jeep Dodge Ram Oconomowoc will assign you a MAX Allowance® used vehicle Seller’s Agent who will work with you to review your vehicle’s unique value to our Used Car, Truck & Van Buying Division. Say goodbye to disappointment around the trade in part of your deal when buying this 2019 Ram 1500 Big Horn. The Ewald Chrysler Jeep Dodge Ram Oconomowoc used truck super center in South Wisconsin is an easy drive or fly in from anywhere in the United States. Our truck super center sits just north of Mukwonago where your 2019 Ram 1500 Big Horn will be waiting for your test drive and/or shipping instructions. We’re glad you found this used Ram 1500 for sale at our truck dealership in Oconomowoc, WI. Looking for financing? Our Ewald Chrysler Jeep Dodge Ram Oconomowoc finance specialist will find the best rates available for this used Ram 1500 for sale. Ewald Chrysler Jeep Dodge Ram Oconomowoc has new trucks for sale and used trucks for sale in Oconomowoc. Your Ewald Chrysler Jeep Dodge Ram Oconomowoc Used Truck Super center near Watertown proudly offers this 2019 Ram 1500 Big Horn for sale, stock# D18D412A. Ewald Chrysler Jeep Dodge Ram Oconomowoc stands out among Southeast Wisconsin used car dealers with an enormous used pickup truck, work truck and commercial truck selection near Milwaukee, Mukwonago, Watertown, Waukesha, Oconomowoc & Brookfield, WI.